HMCan-diff is a method designed specially to detect changes of histone modifications in ChIP-seq cancer samples or between a cancer sample and a normal control. 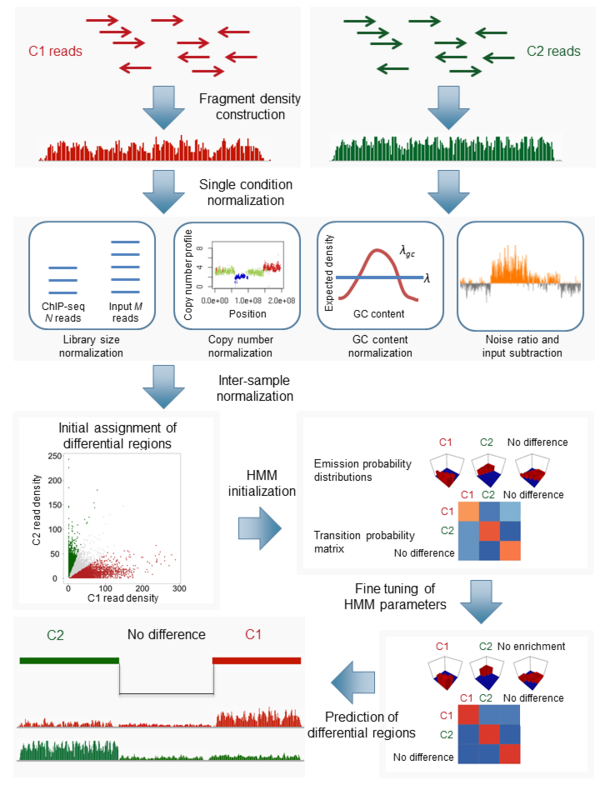 HMCan-diff explicitly corrects for copy number bias as well as for other ChIP-seq technical biases such as GC-content and mappability biases, and variable levels of signal-to-noise in different samples. HMCan-diff uses a three state hidden Markov model to detect regions of differential histone modifications. GCC compiler in order to compile HMCan-diff. GNU Scientific Library (GSL) to be installed on the system. Please check https://www.gnu.org/software/gsl/ for more instructions. Samtools to be installed on system path if BAM files are used (Optional). Compiled binary will be created in the hmcan-diff/src/ folder. HMCan-diff requires three types of external files; it needs FASTA files of the reference genome, a GC content profile, and a blacklist file. Reference genome FASTA files are used to construct GC content profiles on fragment level to use in the GC content bias normalization process. Files should be placed in a folder such that each chromosome sequence is located in a separate file. Names of the files should be identical the one used in the alignment file. Files should have �.fa� suffix (e.g., chr1.fa, chr2.fa, etc.). This file contains GC content and mappability scores for large regions of DNA. This information is used to calculate the copy number profile of ChIP-seq data. We provide precalculated "GC_profile_100KbWindow_Mapp76_hg19.cnp" and "GC_profile_mm9.cnp" in the data directory. Provided files use 100 kbp window size. Please set --largeBin option in HMCan-diff to 100000. If a different window size is needed, please, run the GCCount tool (http://www.cbrc.kaust.edu.sa/hmcan/GCCount.tar.gz) to construct a different GC content profile. This file contains regions that will be excluded from HMCan-diff calculations. Usually these regions are repetitive regions and regions with low mappability. We provide �hg19_blacklist.bed� in the data directory. This file was created by the ENCODE consortium. Blacklist file format is BED format with three columns, which are chromosome, start, and end of the region. HMCan-diff expects aligned ChIP-seq reads in one of the following formats: BAM, SAM and BED. To work with the BAM format, SAMTools should be installed and added to the system path. Peaks: a BED file contains the coordinates of the differential regions between two conditions for a certain mark. Regions: a BED file contains the coordinates of the differential regions between two conditions for a certain mark. Density: WIG files contain the normalized for each data bin for each sample. Posterior Probability: WIG files contain the posterior probability of each bin to be enriched given its value for each state. "Regions" file is useful when analyzing ChIP-seq data for broad peaks like H3K27me3, H3K36me3. Second type of files HMCan-diff outputs is a fixed step Wiggle (WIG) file. WIG file contains normalized density for each ChIP-seq replicate. Also, optionally, HMCan-diff can produce three more WIG files containing posterior probability of each state. After you have successfully downloaded and compiled HMCan-diff, it is time to rut a test example showing the utility of the HMCan-diff tool. Download test files from (http://www.cbrc.kaust.edu.sa/hmcan/hmcan-diff_example.tar.gz) into the hmcan-diff directory. --help Shows this help message and exits. --version Shows program's version number and exits. --name This option passes to HMCan-diff the prefix string for all output files. --C1_label This option passes to HMCan-diff the label for condition 1. This label will appear as the name of condition in the BED files, also it will be included in the WIG file names for ChIP-seq signal. --C2_label This option passes to HMCan-diff the label for condition 2. This label will appear as the name of condition in the BED files, also it will be included in the WIG file names for ChIP-seq signal. --C1_ChIP This option passes the path for the files containing ChIP-seq replicates for condition 1 data. --C2_ChIP This option passes the path for the files containing ChIP-seq replicates for condition 2 data. --C1_Control This option passes the path for the files containing Input DNA files for condition 1 data. --C2_Control This option passes the path for the files containing Input DNA files for condition 2 data. --genomePath This option passes the path for the directory containing chromosome files for the reference genome used for any HMCan-diff run. Each chromosome should be in a separate file, and has the suffix of .fa. --GCProfile This option passes the path for the GC content profile file used in the copy number estimation step. --C1_minLength This option passes the minimum fragment length for condition 1 data. --C1_medLength This option passes the median fragment length for condition 1 data. --C1_maxLength This option passes the maximum fragment length for condition 1 data. --C2_minLength This option passes the minimum fragment length for condition 2 data. --C2_medLength This option passes the median fragment length for condition 2 data. --C2_maxLength This option passes the maximum fragment length for condition 2 data. --iterationThreshold This option passes the threshold for the differential peak score to consider peaks in the training phase of HMCan-diff. Peaks with scores less than this threshold will not be considered as signal in that iteration. --PrintWig This option enable HMCan-diff to report the WIG files for normalized density for each replicate. --printPosterior This option enable HMCan-diff to report the WIG files for posterior probabilities for each state. --blackListFile This option passes the path for file containing regions that should be excluded by HMCan-diff.